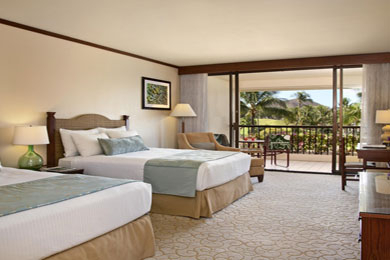 Originally opened in 1986 as the Maui Prince Hotel, this sister property of the Prince hotels across Hawaii was transformed in 2012 with a complete “beautification,” turning it into the now Makena Beach & Golf Resort. Located on Maui’s southwestern end, at the far end of the Wailea area, the secluded resort is situated on 1,800 acres. Makena Beach is lushly and beautiful decorated with landscaped gardens and Koi ponds along a pristine beach. More than 300 guestrooms and suites with private lanais provide a comfortable reprieve in the quiet resort, where families are meant to enjoy time together in a calm and peaceful environment. No kids’ clubs here; guests of Makena come to spend time together along the beach, in the pool, with old-fashioned games, or in cultural activities that teach the family about Hawaiian life while having fun. 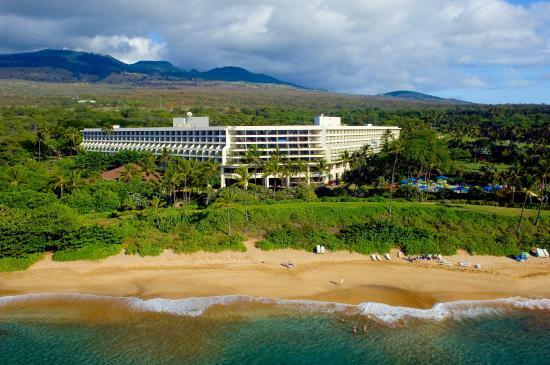 Makena Beach is a full-service resort that considers itself to be a value resort. Parking, Internet and many amenities often included in resort fees at other area resorts are included, and accommodation rates won’t break the bank. Makena features 290 guestrooms and 20 suites on five stories in a V-shaped configuration, each offering ocean or "scenic" views (gardens and mountains). 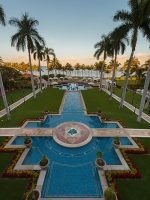 The resort is split into the Pu'u Olai east wing and the Wailea west wing. All rooms and suites offer free Internet and are outfitted with 37-inch, flat-screen TV's, mini-fridges, coffee makers and safes. Cribs are available by request at no additional charge. Rollaway beds are also available by request, but for a fee. Available with double queen beds or a king bed, these rooms are 430 square feet in size, with private lanais. Suites can accommodate up to four guests. Adjoining rooms are available, with a few standard rooms adjoining to suites. 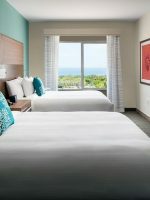 Suites are available as Partial Ocean View (700 square feet) or Ocean Front (900 square feet) and feature separate living space and a bedroom with a king bed or two queen beds, as well as a sofa bed. These rooms offer two full bathrooms, one with a bathtub. Suites can accommodate up to six guests. Complimentary bikes are available for riders 12 and older. Makena offers a children's pool and an adult pool, both overlooking the resort's lawn and the beach. Cabanas and umbrellas are available at no additional charge. On the beach, families can enjoy a number of water sports, including kayaking, snorkeling, stand-up paddle boarding and outrigger canoeing (available to rent). The Kai Kanani catamaran provides tours and dive trips. The nearby Makena Tennis Club provides six lighted tennis courts, with daily programs available for all ages. Lessons and a pro shop are also available. The club is open 7 a.m. through 7 p.m., with court time available by appointment. Court fees begin at $15. The resort runs a number of activities for families to enjoy each day, such as stargazing, ukulele lessons and more. The resort features a miniature golf course, croquet lawn, Bocce ball, sand volleyball, shuffleboard and Ping Pong. During the evenings, head to the fire pit for S'mores. 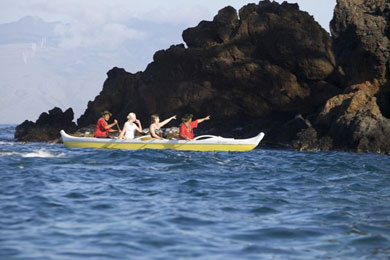 Cultural activities, such as Makena Fishing Experiences, HUKA lessons and lei making, are offered throughout the week. This lobby cafÃ© serves Starbucks coffee and breakfast items, as well as snacks and drinks, from 6 a.m. to 5 p.m. Guests can meet for breakfast in this open-air cafÃ©, open from 6:30 to 11 a.m. The cafÃ© serves both a breakfast buffet and a la carte items. Breakfast packages are available to include morning meals with accommodations. For dinner, this open-air restaurant overlooks the ocean and provides island-inspired dishes between 5:30 and 10 p.m. daily. Live entertainment is featured nightly, and the restaurant features special events. Special meals range from Stargazing Dinners, Lobster Fests and Friday-night Island Buffets. The restaurant is also open for the resort's premier Sunday Brunch, from 9:30 a.m. to noon. The brunch here is so good, it's been named one of the best brunches on the island. For lunch options, this poolside grill features wood fired oven pizzas, sandwiches, burgers and snacks, as well as fruit smoothies and drinks. The grill is open daily, from 11 a.m. to 5:30 p.m. A kids' menu is available for guests between 5 and 12 years and offers grilled cheese, burgers, chicken and more. Room service is also available from 6:30 a.m. to 10 p.m. daily. 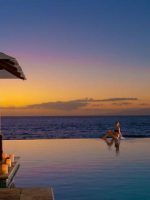 Stay at the Makena Beach & Golf Resort on Maui with the family and be sure to choose the complimentary Family Value Pack package. This package can be added to any room booking and works in combination with any of the resort's promotions. Families who sign up for the pack will receive one free family admission coupon to the Maui Ocean Center, one coupon per child for a toy to be exchanged at the resort's Makena Mercantile, and a daily $40 credit of Keiki dollars that kids can use throughout the resort. Additionally, babysitting can be arranged through the concierge. Maui is a year-round destination due to its tropical location and temperatures, and Makena is a dry, sunny area of the island. Peak season for all resorts on the island is during the winter holidays, Easter and spring break and the summer months, so to save on accommodations, visit during the off-season. Makena Resort, however, is a smaller, more intimate resort that doesn't feel crowded during its peak. Makena is located at the far end of Wailea, a bit more secluded than Wailea and near one of Maui's best state parks and beaches, Oneloa Beach, or "Big Beach." The resort is about 19 miles from the Kahului Airport, which is approximately 45 minutes by car. Taxis to the resort will run around $75. 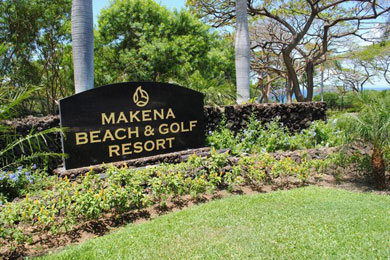 While the resort is on the free Wailea shuttle route that connects each resort to the shops of Wailea, resorts and golf courses, guests may prefer to rent a car to explore other areas of the island and get to and from the property. For a little "me" time, visit Makena Kai Day Spa on the property to enjoy massage treatments in an outdoor, secluded environment. Massages of 25 to 80 minutes with special enhancements and exclusive treatments may be scheduled from 8 a.m. to sunset daily.